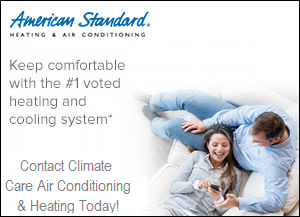 At Climate Care Air Conditioning & Heating, we firmly believe you should never be forced to pay over-inflated expenses for necessities such as a quality air conditioning and heating system installation or routine maintenance your system requires. 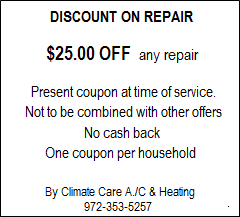 With that said, we are happy to offer money saving offers that will return your valuable dollars where they belong...in your pocket! 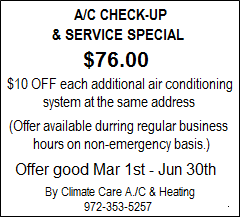 We also encourage you take advantage of our annual preventative maintenance program that will provide a minimum of two scheduled visits per year in which we will perform an extensive check-up on your air conditioning and heating system and also report any deficiencies we may find. We encourage you take full advantage of any offer we have and also let us know if you found us on the internet. 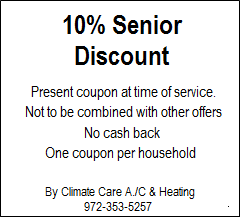 In addition, coupon must be presented prior to work we performed. 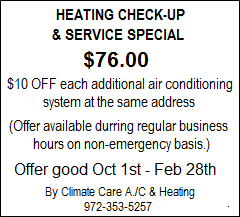 If you have any questions or would like to schedule a service call, please contact Climate Care Air Conditioning & Heating at 972-353-5257. For your convenience, feel free to request services from this site. 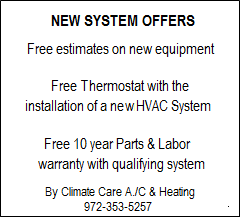 If you have any questions or would like to schedule a service call or a free estimate on new equipment, please contact Climate Care Air Conditioning & Heating at 972-353-5257. For your convenience, feel free to request services from this site.